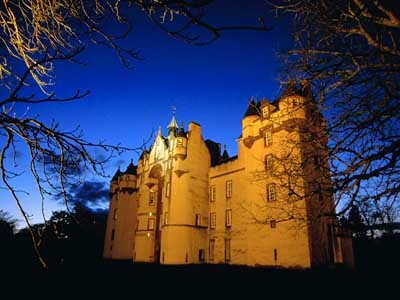 Is Fyvie Castle in Aberdeenshire really haunted? Fyvie Castle is a 13th century castle in Aberdeenshire, Scotland. Some sources claim that the castle was actually built in 1211 by William the Lion (William I) who reigned as king of Scots from 1165 to 1214. Whether he actually built this castle though is something still debated between historians. One thing we do know is, that each of the first 5 families to own the building(Preston, Meldrum, Seton, Gordon & Leith families) added a new tower to it. The descendants of the Leith family eventually sold the castle to the National Trust for Scotland in 1984. Thankfully the castle is open to the public & tourists during the summer months! One of the most chilling events to take place in the building (in my opinion) happened during some renovation work during 1920... Workers had uncovered the complete skeleton of a young woman from behind a bedroom wall. The remains were duly laid to rest in the nearby cemetery, however, the castle residents started being plagued by strange, unexplainable noises, odd lights and the movement of objects & furniture.